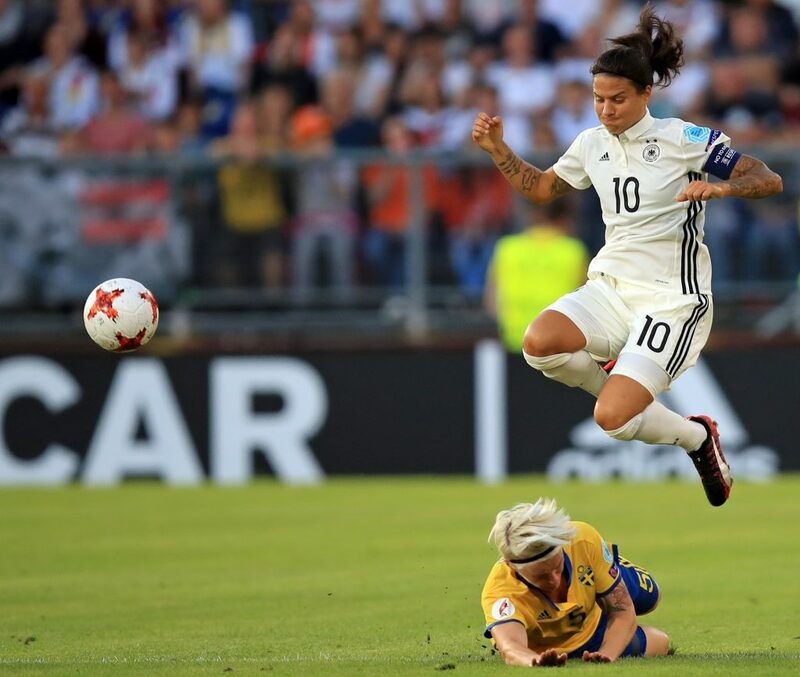 After a very competitive and combative 0-0 draw, in which these two heavyweights of the women’s game had chances, both keepers excelled and Germany came away a little less content with one point, we bring you the reaction from the press conference, CHRIS BROOKES reports. Given the history, a point may look like a victory for them against Germany, but is she disappointed? No, I have to say that the way it turned out to be, with chances and especially with the way we defended, I think it’s okay. Of course, it could have been a better result, but on the other hand, I think it’s a good result to start the tournament, which for us has been very crucial (in the past). If you compare to the other tournaments, we struggled a little bit, so this time, I have to say I’m satisfied. 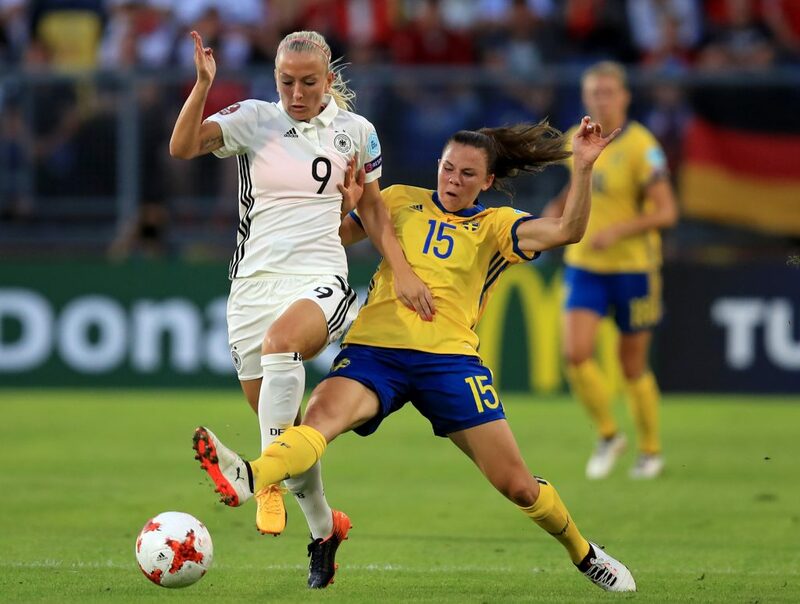 Player of the Match was Dsenifer Marozsán, did she feel Nilla Fischer or Hedvig Lindahl would have been a better choice? Marozsán is a great player, so that will do for me, thanks. Why didn’t Stine Blackstenius start, given how well she did when she came on in the second half? Well, the reason she played well was because she was on the bench from the beginning and came off the bench. That’s the plan we had. What’s the situation with Olivia Schough’s injury? When we took her off, the medical team said ‘do you want her to play?’ and I said ‘well, not necessary; we need her in the whole tournament.’ I haven’t checked right now but I think she will be fine, so it’s just the way that we want her to play in more games and that’s why we were a little bit careful with her. I don’t think it’s a problem. Asked about the bad corners from Sweden? (Laughs) It’s funny because we practice quite a bit with corner kicks and Olivia’s done very well, with the whole team, but today, they struggled a little bit. I would say that’s okay today; it will not be okay against Russia. How important is the next game, with Sweden on a point and Russia on three? It is very important of course. First of all, if you take the self-confidence that all of us gained today, a lot of situations we’ll bring up and look at, playing against Russia will be very important. I’m really happy that we have some days to recover, because some of the players out there, I think they’re really tired. The way the game turned out today was tough, some good performances, but we will be prepared for the Russia game. What did she think of the general quality of the game? I think it was okay. Some interesting chances, and a little bit of just waiting to see when we should attack and when we shouldn’t. If you look at it as the first game in the tournament, I think it was okay. When we prepared for bringing her on the pitch, the only thing we said to her was to try to get a footrace, and ‘every time you touch the ball, just go forward.’ You say that when you have a limited time to play; you can’t say that at the beginning of the game. I think she did exactly what she was supposed to do. She had a little bit of a touch where it went out of bounds, but she helped us quite a bit with the way she played, so I’m happy with her performance. Was she more frustrated with the first half or happy that the second half went a bit better? I always like to see the positive side of things, so I’m happy that the team carried out the instructions as given by the coaching staff at half-time. The first half, there was a little bit too much respect for the Swedish team, but we fought from the first minute onwards, so we can be happy with that. You came close several times but what was missing? I think the last pass was not really good from us, and the concentration on the last shot was not exact, so I think that was the problem. Second half, we had some good combination, just the last pass or shot was not exact. Sweden always play in a tight formation, with a compact defence and playing on the counter-attack, so it was like we prepared for. Asked about her saying something for only five minutes during half-time – and who generally does the talking during this scenario? (Smiling) Why is it so special that I only spoke for five minutes during half-time? I’m always pretty concise in my wording! 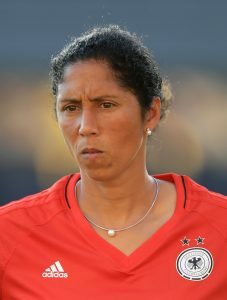 Normally, the players come in and sit down, then I mention one or two points and everyone has to go and do their own thing; go to the toilet or make their own preparation for the second half [some laughter among Steffi, press officer and translator]. So, that’s usually how it goes. Opinion on the Sweden team they played tonight? We kind of expected Sweden to play like this; with a very tight-knit defence and danger on the counter. Of course, there is always danger of a counter if your forward pressing isn’t successful. We expected Sweden to play like that. 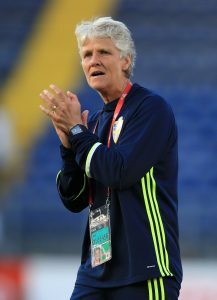 Pia says Sweden took a lot of confidence from this match, what does Steffi take? Well, I told my team they shouldn’t be too disappointed with the match. Second half was quite good and we have to continue with what we do well – combination football, be dominant – and perhaps play a bit more forward with an attacking style. What was the thinking behind playing Kristin Demann at number six and Sara Däbritz in midfield? Demann has good ball control and is very consistent, even when pressured. Sara can also play very well in the construction of an attack, to play forward. Sara is a great attacking player and she’s also shown she can put pressure on the offensive, and she showed that in the match. Will we continue to see a lot of attacking players subbed in during the tournament? Italy of course has a different playing style than Sweden. They don’t just play on the long ball forward, and we have players capable of playing multiple styles. We can put on different combinations of players also. Her feelings during the match – more joy or torment (reference made to Mandy Islacker going close to scoring)? Of course, the joy is superior in that every time there is a chance or a corner kick you do want the ball to go in, and you do feel it with every fibre of your body. In the second half, I was confident that we were in control and the goal would come, but unfortunately it didn’t work out. After today, how will she relax and regroup for the next match? The bench players will get an extra day training, and after that, they will be joined in the second training by the entire group. We will also analyse the match from Sweden, with of course the positive points that we had, and then it’s quickly onwards to the match against Italy. This has also been a learning experience for the team and we have to analyse what we got out of our preparation for the match; perhaps we will need to modify the preparation slightly towards the next match. First time coaching a game at a major tournament – how does it compare to playing in one? I’m of course happy it started. In the weeks leading up to this match we have prepared a lot, and it’s a relief that the show is finally on the road. As a trainer, you have a different responsibility because as a player, you’re focusing on the match; as a trainer, you’ve also got the final responsibility that everything goes well. It’s a different pressure, but not heavier.